Switching magnetization rapidly, locally, and under next to no magnetic field, is one of the main challenges in improving the storage and manipulation of magnetically coded information. The approach considered here consists in using inverse magnetostriction, i.e. the modification of the magnetization orientation under strain. This process is very efficient when the strain is induced dynamically by an acoustic wave. It has just been demonstrated by a group of researchers at the Paris Institute of Nanosciences that in a magnetic semiconductor, surface acoustic waves coupled to magnetization turn out to be capable of efficiently reversing magnetization in 2 different geometries (resonant or non-resonant routes). In a magnetic film evidencing a privileged magnetization direction (a so-called « easy axis »), magnetization can switch in two different ways depending on whether the magnetic field is applied parallel or perpendicular to it. We have revisited these two mechanisms in the presence of magnetostriction, by considering the case of a surface acoustic wave-induced strain . These elastic waves make the atoms oscillate at a few hundreds of MHz, precisely along the direction allowing an optimal coupling to the magnetization. 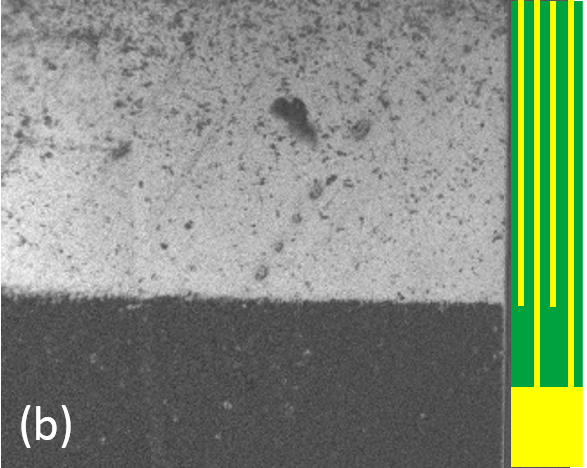 The material under study was a thin 50nm layer of (Ga,Mn)(As,P) magnetized perpendicularly to the plane. 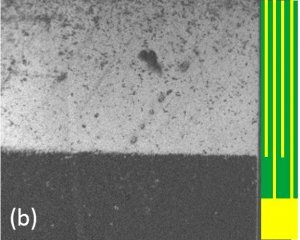 This low Curie temperature (<100K) magnetic semiconductor has a well-understood magnetostriction that can be tuned during its epitaxial growth. We had previously demonstrated that its magnetization indeed couples to a surface acoustic wave . The first mechanism is called « precessional switching ». The energy “pass” separating the two (“up”/”down”) equilibrium magnetization positions is first lowered by a magnetic field applied along the hard axis. A minute pulse of a second magnetic field then suffices to knock it out of equilibrium. In certain conditions, the resulting movement of the magnetization (“precession”) is of sufficiently broad amplitude to tip the magnetization in the other energy valley. By stopping the excitation in the middle of a cycle, the magnetization can terminate its trajectory opposite its initial position. The optimal duration of the excitation depends very finely on the magnetostrictive coefficient, and on the amplitude of the acoustic wave. In this geometry, we demonstrated experimentally that an acoustic wave can indeed switch the magnetization of (Ga,Mn)(As,P) . It is the magnetostrictive coupling that generates the small effective field triggering its precession (Fig. 1). It is all the more efficient when the magnetic field tunes the magnetization precession frequency to the acoustic wave frequency (549 MHz). In this respect, (Ga,Mn)(As,P), with its low magnetization and precession frequencies, makes things particularly easy. A surface acoustic wave (SAW) is emitted by interdigitated transducers. The easy axis is perpendicular to the plane. During its propagation, the SAW couples to the magnetization, and may trigger its precession if the field is applied in the (magnetically hard) plane. In the second approach, a field is ramped up along the easy axis, opposite the initial magnetization. Small magnetic domains eventually nucleate along the field. They grow until the entire layer switches at the coercive field. The energy cost of creating these domains depends precisely on the magnetostrictive term, and therefore on the strain felt by the material, alternatively positive or negative. Under SAW, the nucleation of domains will therefore be facilitated every other half-period. In this geometry, we have observed that the propagation of an acoustic wave during the application of the field induces over a halving of the coercive field  (Fig. 2). Kerr microscopy image (690 x 924 µm²) of the magnetization switched on the path of the acoustic wave. The SAW is only emitted in the upper 2/3 of the image. These results therefore validate the concept of acoustically assisted magnetization switching. Being a “wave-induced” switching, it opens the possibility of fine spatial control of magnetic bits, for instance by having several waves interfere. The next step is now to extend these results to materials functioning at room temperature (nickel, galfenol), but in which obtaining a resonant coupling at reasonable field strength will be challenging.